A small blip, or signs of changing times? Solar power is a very popular form of renewable energy. Whole countries are scrambling to finance more solar farms, and the price of generating solar energy is falling, offsetting previous criticism of high prices. This massive push towards solar energy has led to a startling revelation. Climate change analysts, Carbon Brief, have revealed that the UK has generated more energy from solar panels than from coal-fired power plants for the past six months. Carbon Brief reports that the UK has produced an estimated 6,964 GWh of electricity from solar cells. This is 10% higher than the 6,342 GWh generated by coal. This is equivalent to solar providing 5.2% of UK electricity demand, as compared to 4.7% for coal. The analysts note this trend is due to the country’s seasonal cycle. Since there is less demand for energy in the Spring and Summer months, the country can rely on solar generated power to help meet its demand. 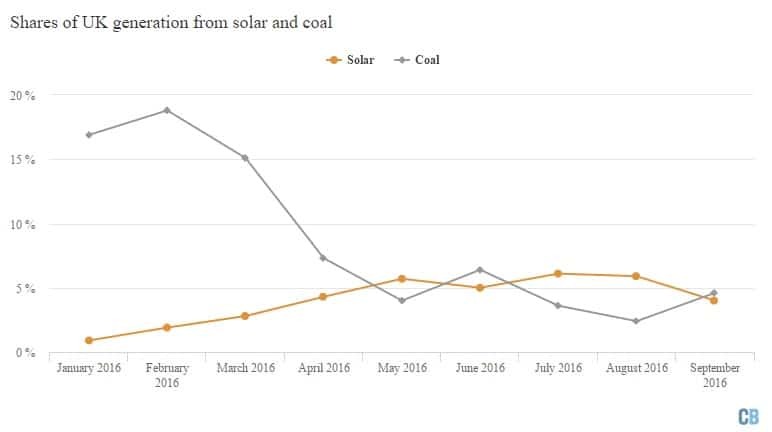 The UK’s solar power generation has eclipsed coal for a whole month in May 2016, and for a whole quarter from June through September. They also note that the UK’s capacity for solar has increased, from 6GW at the start of 2015 to 12GW now. Solar generation is definitely increasing, with a 26% uptick in 2016 to date, as compared to the same period last year. Still, this does not mean that solar has completely won in the UK. As we’ve mentioned, the seasons are shifting and the winter months are at our doorstep. Colder, darker months require more energy and the trend of solar generation is not likely to keep winning. The government has also been showing signs of slowing the support for solar. December of last year, the UK cut several subsidies for solar power. It decreased subsidies to householders installing rooftop solar panels by 65%. It has also cut into a second subsidy scheme known as the renewables obligation. It is estimated that this could wipe out 18,700 jobs in the solar industry.